Editor’s Note: Today we would like to introduce Carla Bigio, a passionate chef based in Madrid. But her story is not so simple, originally from Madrid, from an Italian/Colombian mother and a Egyptian/Syrian father, she bounced around the world from the Bahamas to Switzerland before finding herself in the center of Spain whipping up dishes that lights her international soul on fire. Having spent a significant time in Barcelona and Madrid, we asked her feedback on what makes each city the gastronomic giant of Spain. Read Part 2 here. From a tourist’s perspective, Spain is Spain, right? Nothing could be farther than the truth. Barcelona, and Catalonia for that matter, has never considered itself Spain, and why should they? For 1500 years they were their own country, with their own language, and many, many occupations spanning from the Romans, to the Visigoths, Moors and Jews. Only upon the marriage of Ferdinand and Isabel, did Catalonia become part of the Spain that we now know. All of this has highly influenced Barcelona’s gastronomic cultural identity. If you dig deeper than the Ramblas’ offer of frozen Paella’s and Tapas, which incidentally is about as Catalan as sushi, you can taste the influence of Barcelona’s myriad past. Barcelona has always been more open to new flavors, incorporating them into their food, and making it ultimately theirs. Such Catalan classics, like espinacas con pasas y pinones, canelones or romesco, have their origins in other cultures. Because of this, I have come to believe that is why it became such a laboratory of experimental cuisine. Seaport cities have always been easier influenced than their landlocked counterparts, so it stands to reason that Barcelona has reigned in that creativity. When I first landed on Barcelona’s sunny shores in 2002, I was absolutely amazed and dazzled by the food scene, and the buzz word was definitely “Ferran Adria”. Adria singlehandedly transformed the face of food today. Every restaurant that I went to throughout the years had some version of foam, gelatin or “air” on the menu. Yet I strived to find somewhere that incorporated Catalonia’s magnificent heritage, but alas, those places are few and far between. A walk down any of Barcelona’s main tourist thoroughfares, and I found a plethora of places offering mediocre tapas and paellas, or El Bulli knock – offs. I was searching for the old Catalonia, the places that influenced Adria on his journey to honing his craft. There are three that stand out, in my mind, to be some of the best offerings in the city for traditional Catalan food. Restaurant Cheriff is one, off of the Barceloneta’s main drag, the Passeig de Joan Borbo. Old school, dark and completely and utterly lovely, this is where you can still find older local couples dressed finely, with their bottle of Cava waiting patiently for their Paella or Fideua. The menu is very basic, consisting of your typical Catalan seafood dishes, such as bunuelos de bacalao (codfish fritters) and musclos a la marinera (mussels in a tomato broth) but the real prize is the love and care that the robust owner has put into her food. There are quite a few main options to choose from, but when I go, I go the traditional route, paella or fideua. Fideua is the Catalan version of the paella, made with noodles instead of rice, fried and then boiled in a seafood broth with cuttlefish; then lastly baked in the oven until the noodles “stand up”. For me, they make the very best ones in Barcelona. The bow tied waiter brings it to your table, and then promptly whisks it away to dish out on to your plate. Other classics to order are the chipirones, baby squid flash fried to perfection, crispy and not oily at all. 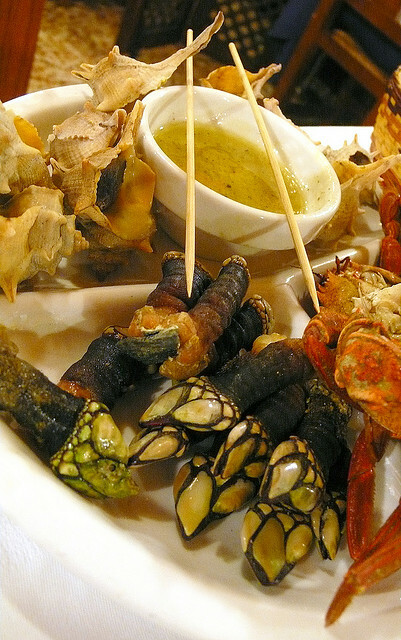 And their Caldereta de Langosta, or lobster stew with rice, is worth a try too. In my old neighborhood of El Born, I recently discovered a rare find; a gastronomic paradise completely traditional and creative traditional Catalan dishes that won’t break the bank called, Restaurant Estrella. Tucked in a side street next to the Estacion de Francia, from the moment you sit down, the owner guides you on a magnificent journey of food heaven. The menu itself is mouthwatering, comprising mostly of Bacalao (codfish) prepared in a variety of ways. But order the specials, which he lovingly describes, and you’re in for a rare treat! One such night we ordered fresh razor clams from the Delta del Ebro, smaller than their ocean couterparts, sweet and succulent, with just a hint of walnuts sprinkled on top. Simple, yet masterful! 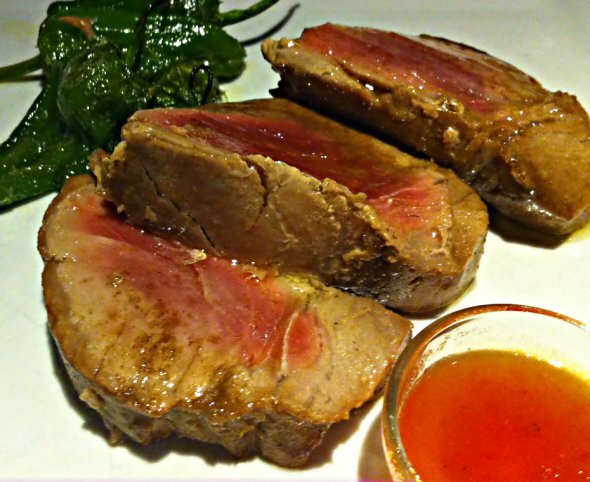 My companion ordered the fresh line caught yellowfin tuna, served with a touch of fleur de sel and a lovely tomato confit with just a few padron peppers on the side. I haven’t tasted a fresher tuna yet. Whatever you do, leave room for dessert. I was lucky enough to go in autumn, chestnut season, and my selection was based totally on that wonderful nut. I ordered the tiramisu with homemade chestnut ice cream. Decadent and light, it lived up to all of my expectations. I’m Italian, so I have a lot of them. Last but not least, is my absolute favorite restaurant of them all, Can Pineda. If you’re not familiar with Barcelona, it is absolutely impossible to find. Nestled in the very un-touristy neighborhood of El Clot, this place has a serious following. The menu changes with the seasons, and only the best fish, meat and produce grace their kitchens. Slightly more expensive than most, it really should not deter you. Trust me, it’s worth every penny. If you are ever so lucky to go in November or early December, make a bee line to it. 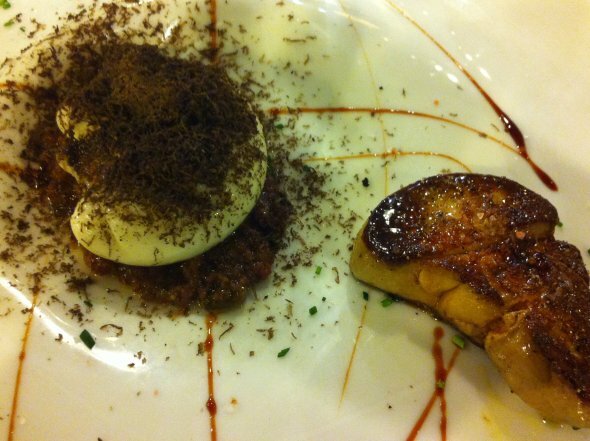 It’s truffle season and Can Pineda goes all out. The restaurant decor is nothing to write home about, kitschy and a little tired, but it all adds to the experience. You truly feel like you have walked grandma’s home, and trust me; you’re in for a real treat. If I had to choose a last meal, Can Pineda’s poached egg with black truffle, seared foie gras and balsamic reduction over a bed of blood sausage would be the one. It is an absolute homage to the rich man/ poor man. Eggs, to me, are nature’s perfect, and most humble, of foods. Add the foie gras and truffles and you’ve elevated to royal status. If that seems too rich for you, their Gambas de Palamos is something not to be missed. Extremely large, if not gigantic, fresh shrimp from Catalonia’s rich shores are treated with the utmost of respect. Seared and served with just a touch of extra virgin olive oil and Maldon sea salt, it is truly a thing of beauty. Tender, juicy, sweet and briny, you don’t need anything else. Again, if you have a sweet tooth, you have to leave some space for their classic dessert. Phyllo dough parcels stuffed with dark chocolate over raspberry coulis. When it arrives at the table, you aren’t especially surprised, but once you pop it in your mouth… hot and cold at once, it is a mind-blowing experience, making your taste buds and senses trip the light fantastic. Unfortunately, places like these are slowly going extinct. All three recommendations have one thing in common, there are no Michelin Star chefs, no fancy lighting or décor. The true star here, and as long as they are open, is the food. Unfussy and delicious, made with pride and care, these are places worth searching out if you’re ever in Barcelona. You won’t regret it. Make sure to check out our tours if you’re keen to find the very best of Barcelona cuisine!